p. 18. Design for a New Millenium, ed. E. Laquian (1996). Institute of Asian Research, Vancouver. Script for an Asian Landscape is a sculpture comprised of six separate but interrelated units which can be found outside the west entrance of the C.K. Choi Building as well as in five locations in the central entrance and stairwell of the building, and in the dome of the reading room. It must be considered that Asia is not a unified entity and contains cultures as widely different as does any vast continent. Attempting to find one symbolic element to represent those cultures is an impossible task. This sculpture instead derives its imagery from that which is shared by all in Asia — the land. Land remains throughout time and history. Its surface holds memory, the imprint of human habitations that have come and gone. As a metaphor, it represents our deepest yearnings for belonging to the continuum of life. Its beauty can provoke a profound response that carries us beyond our own lives into realms without borders and cultures, uniting us through a universality of experience. Hence, the sculpture takes the form of a journey in a landscape where elements are placed in six locations in the main circulation axis of the building and are encountered in different sequences as one walks into and through the building. An individual approaching the building from the west along the path between the Asian Centre and the Choi Building will find adjacent to the path, some little distance from the building, four similar rounded granite boulders in a grid arrangement. These boulders have works in four different Asian scripts, all giving a different interpretation of the concept of “granite stone.” The scripts are Chinese, Japanese (Kattagana), Korean, and Hindi. The third element of the work can be found on a support post next to the stairs as one walks up the central staircase to the second floor It is a small glazed box constructed of zinc and inset flush with the face of the post. In the box are engraved zinc images of the leaf, fruit, and seed of the gingko tree, identified with a label with the Latin botanical description, Gingko biloba L. The trees planted along West Mall in front of the building are gingko trees, an ancient species also known as the Chinese temple tree. In the reading room, there is a brightly colored yellow and black bird, a black-hooded oriole, Oriolus xanthornus, fashioned from epoxy plastic and metal, mounted upon the rim of the dome over the lounge area. This particular bird has a wide range in southern and eastern Asia and it is known for its beauty and melodious song. In the bird’s bill is a small ring. If the viewer follows the natural inclination to sight through the ring, a similar larger ring, mounted on a perch-like metal device projecting outside beyond the rim of the dome, can be seen. Sighting through both rings one is looking out, day or night, toward Polaris, the North Star, an element of the landscape all of us in the northern hemisphere know and share. There is a second ‘artwork’ consisting of five traditional philosophical stones with text in both Chinese and English. This grouping is located on the plaza at the south end of the building. This work is a distinct piece in itself and not part of the Script for an Asian Landscape. pp. 22-23 Design for a New Millenium, ed. E. Laquian (1996). Institute of Asian Research, Vancouver. In this age of accommodation, very few things are carved in stone. Yet in the Asian plaza at the southeast corner of the C. K. Choi Building there are at least five. These are Chinese characters engraved on huge stones shipped all the way from Taishan (Mt. Tai) in Shandong Province (China) where Confucius was born. They form the centerpiece of the Stone Garden. Each character represents a virtue extolled in the Confucian Analects, with supporting quotations from a variety of ancient sources, here summarized. Ren (humanity, benevolence)—as shown in compassion, sympathy, respect, understanding, respect and honor for one’s parents, and love for others as one loves oneself–is the essence of all virtues and the ground of human dignity. This is the ultimate foundation of Confucianism. Yi (righteousness)—is the principle of conscience as well as the just relationship of human beings. To be unbiased and impartial, to conduct matters in an appropriate manner, and to respect people of virtue and to be tolerant of others–is to be upright and selfless. The realization of yi is attained when humankind sees righteousness as superior to profit and the society takes justice as superior to property. Li (propriety, rites)—There are 300 rules of rites and 3,000 rules of dignified behavior. If one is well-behaved like the compass and carpenter’s square for drawing circles and squares, then one can establish oneself. Hence a social system based on interpersonal relationships can be established. Zhi (wisdom, knowledge)—Wisdom can see things not yet materialized. It covers all matters. It enables one to distinguish between right and wrong and to respond to a situation in an appropriate and moral way. The ideal of zhiis wise decision making. Xin (trustworthiness)—The four virtues of benevolence, righteousness, propriety and wisdom are at the four directions while trustworthiness is in the middle. The centre’s attribute is the element earth. All living things cannot flourish without the earth just as the four virtues cannot be established without trustworthiness. If one can keep it vigilantly without losing it, one will have many blessings for a long time to come. 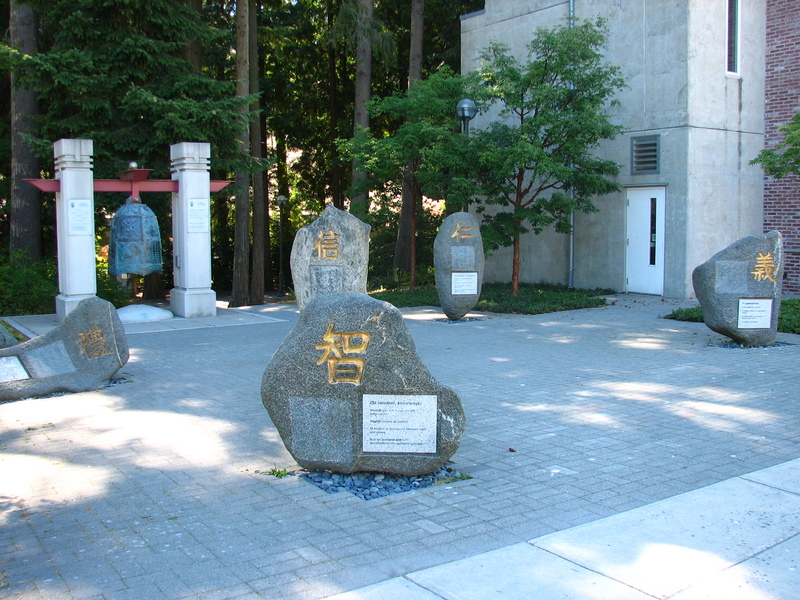 The Asian plaza at the south end of the C. K. Choi Building is the gateway to UBC’s Asian Precinct–the north-west corner of the campus comprised of the Asian Centre, the Nitobe Gardens and the new C.K. Choi Bldg. for the Institute of Asian Research. It has a small courtyard paved with recycled pavers rescued from a brick yard that was about to break them into pieces for other use. An arrangement of huge stones forms the nucleus of the plaza. When the wooden crates containing the stones were crowbar-opened at UBC, the architects, the structural engineers, and the landscape architect immediately saw a problem: “How do you make these huge stones stand on their ends?” The rocks vary in size, shape and balance. The point at which each rock was supported required a special support in order for the rock to appear that it is balanced from a small point at the base. Many minds quickly went to work. Early ideas considered the use of various exposed supports but these options were rejected for not fulfilling the desired look. 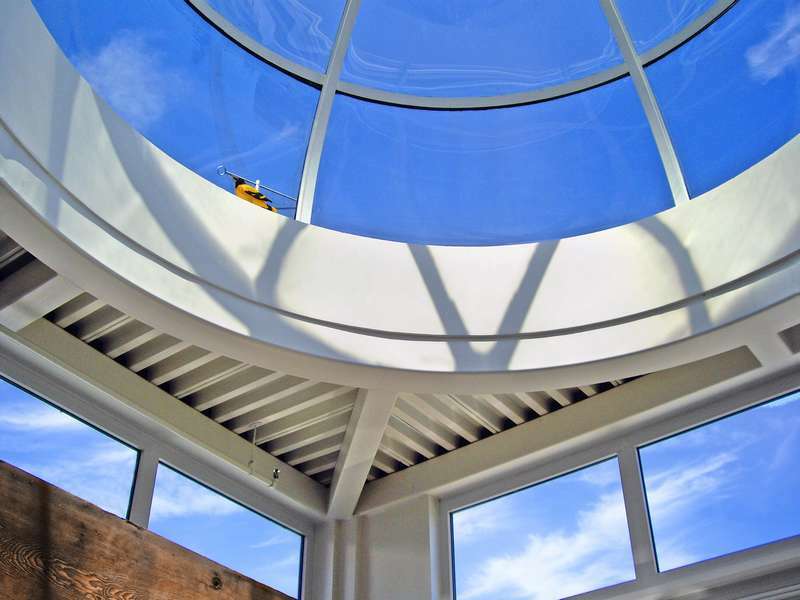 Sheets of calculations and drawings later, a solution was found and Read Jones Christoffersen Ltd. structural engineers translated it into action. Each rock is supported by a concrete footing with dimen-sions 4′ x 4′ x 1′. From the footing a 3 1/2″ steel pipe projects 18″. A 4″ diameter hole x 18″ long was drilled into the base of each rock. The holes were then filled with liquid grout and then lowered onto the pipe projecting from the footing. Landscaping was used to bury the footing and base of each rock. Though the solution looked simple, the execution was not. The largest rock stands six feet high and weighs approximately 5000 lbs. The smallest rock is four feet high and weighs approximately 4000 lbs. The Confucian virtues inscribed on the stones were chosen by the major donor of the building, Mr C. K. Choi, in order to share with the community the traditional Confucian philosophy that has guided him in his life. Firmly believing that in cultural exchanges between East and West, both can merge more harmoniously for mutual benefit if guided by ethical principles and values, Mr. Choi hopes people would learn some guidelines from these Confucian virtues. Seven paperbark maple trees have been planted around the square and will eventually provide a canopy of shade for those who wish to sit on the stone benches and meditate on the meaning of interrelationships among human beings and their relationship with nature.